Unable to stop a thief from stealing his father's modest nest egg, young Vincent grows up blaming himself for his parents' sudden suicide. Becoming a priest [Gary Cairns] who operates a highway-based ministry with his ambivalent brother Michael [Luke Albright], Vincent's services include offering sage confessional advice to regular sinners while raining death on unrepentant thieves. Into the world of this antagonistic duo comes Mary-Francis [Trista Robinson], a psychotic, resourceful woman whose first act of "kindness" is to kill a thief whose actions threaten to expose the holy brotherly duo. Filled with gratitude for this act, Vincent invites Mary-Francis into their sacred world and triggers a gruesome chain of deadly events that threaten to dismantle the brothers' decades-long partnership. this is a disturbing slice of here-and-now Americana in which serial killers are only part of the story. Purgatory Road is a tour-de-force for the senses that stays with the viewer long after the closing credits rolls. 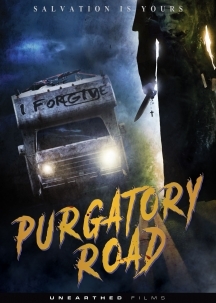 Purgatory Road is fantastic in every way. Completely compelling.